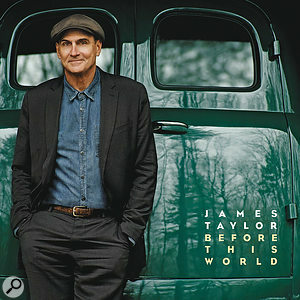 Forty–seven years after the release of his self–titled debut album, James Taylor finally achieved his first American number one in June this year. His 17th studio album, Before This World, surpassed the chart placings of Taylor’s classic early–career albums Sweet Baby James (1970, US number three) and Mud Slide Slim And The Blue Horizon (1971, US number two). Before This World also enjoyed notable chart success in several other countries, reaching number four in the UK, for example. There has been a 13–year hiatus since Taylor’s previous album of new material, 2002’s October Road, punctuated only by an album of covers called, well, Covers (2008), a few live albums and a Christmas album. In interviews, Taylor indicated that modern life was simply too busy for him to take the time off he needs to write. The other major challenge for any older artist is to come up with something that’s not only relevant today in terms of music and lyrics, but that can also compete in today’s sonic landscape. Given Before This World’s success, O’Donnell clearly made the right call in drawing back from trying to make the album sound overly contemporary. In so doing he drew on decades of experience, going back to the days of analogue and non–over–compressed records. O’Donnell started his studio career in 1984 at the legendary Power Station Studios in New York (now Avatar Studios), where he quickly worked his way up from runner to engineer, and worked with legendary producers like Russ Titelman, Phil Ramone and Neil Dorfsman, as well as the engineers on staff there. O’Donnell went independent in the early ’90s and has amassed an impressive list of credits, including Eric Clapton, Keith Richards, John Mayer, Lyle Lovett, the Bee Gees, Milton Nascimento, Rod Stewart, Cyndi Lauper, Joss Stone, Morrissey, Tina Turner and Ray Charles. In so doing he has been nominated for three Grammy Awards, winning one. Russ Titelman brought O’Donnell in to engineer and mix October Road, a collaboration which marked the start of a long–standing and very fruitful working relationship: O’Donnell worked with Taylor on the Covers album, the Other Covers EP (featuring material culled from the Covers sessions), and several other projects. Most notably, O’Donnell recorded, mixed and produced the live One Man Band (2007). 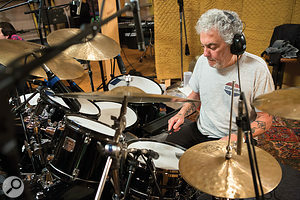 As Taylor explains in his comprehensive liner notes for Before This World, the first step towards making the album consisted of him inviting O’Donnell, drummer Steve Gadd and bassist Jimmy Johnson to his house in rural Massachusetts. It was January 2010, and the aim was to simply record some demos with no particular purpose in mind. Taylor’s backing band was tracked live at the Barn, with the singer/guitarist in a booth. This photo shows the layout of the large space where the musicians played together. According to Taylor’s liner notes, he completed the writing for the album at the end of 2013, and in January 2014, invited O’Donnell and the core of his live band — Gadd and Johnson, as well as guitarist Mike Landau and keyboardist Larry Goldings — to a second series of sessions, which produced the basic tracks. These recordings once again took place in the barn adjoining Taylor’s house, with the engineer/producer bringing recording equipment either from his own Studio D or from a hire company. “The Barn is a property built about 15 years ago on James’s land,” explains O‘Donnell, “about 300 feet away from his home. It’s a very functional, modular kind of space, which he uses for rehearsals and recordings. The main room is just a great acoustic space, not so large as to be too reverberant but also not so small that you get a lot of early reflections. It’s a great–sounding room, and inside it we have a couple of makeshift rooms. We use one as the control room and another as a booth for James to be in, plus there’s a small room with the piano. Nothing is 100 percent isolated, either between rooms or from the outside, but it’s out in the woods so it’s relatively quiet. With no permanent control room or recording gear available at the Barn, Dave O’Donnell set up a temporary working area to house a selection of his own equipment and rental gear. 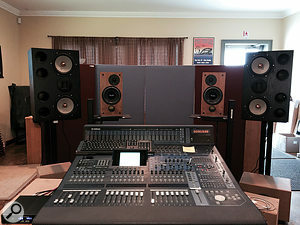 The album was eventually mixed on this Yamaha DM2000 digital desk. 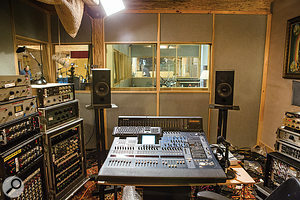 Behind the desk at the Barn, with the equipment installed, O’Donnell set about capturing Taylor’s songs, not only technically, but also by giving feedback in his role as the album’s producer. However, with a lifetime of experience of writing songs at the highest level, James Taylor didn’t need a great deal of input in this area. 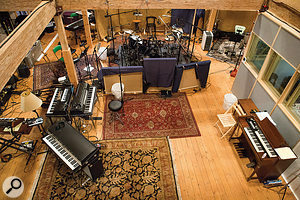 According to the producer, the way the songs and arrangements found their final form during the 2014 sessions was “very organic. Just like with the demo recordings, James would play us his songs in a guitar/vocal version, and the band would listen and would gradually join in. We occasionally referenced what we had from 2010 — Steve in particular wanted to hear his drum approach for the song ideas at the time — but we did not use any of the demo recordings. Everything was replayed. The guys in his band know what to play, and they then fall into an arrangement and a groove pretty quickly. Things will morph a bit, and they will try different things, and there’ll be discussions about the arrangement, with the band and I offering suggestions. O’Donnell’s own personal preferences, the capabilities of the players he was working with and the facilities at the Barn, all led to Taylor and his band being recorded live, with the singer in his separate booth. “Whoever you’re working with, a good record starts with great basic tracks. To achieve this I prefer recording as many musicians as you can all at once, even as I also enjoy overdubbing vocals and additional parts as a way to enhance or add to the song. In general I’m not a fan of setting out to do basic tracks part by part. It never feels as good as playing as much of the music as you can all at once. “James has a great band, whose members are all capable of playing in any style, so it was easy to get the basics for the bulk of the songs as a full band. When recording a band live in the studio you always know you can edit different takes together, but with this band we never have to. 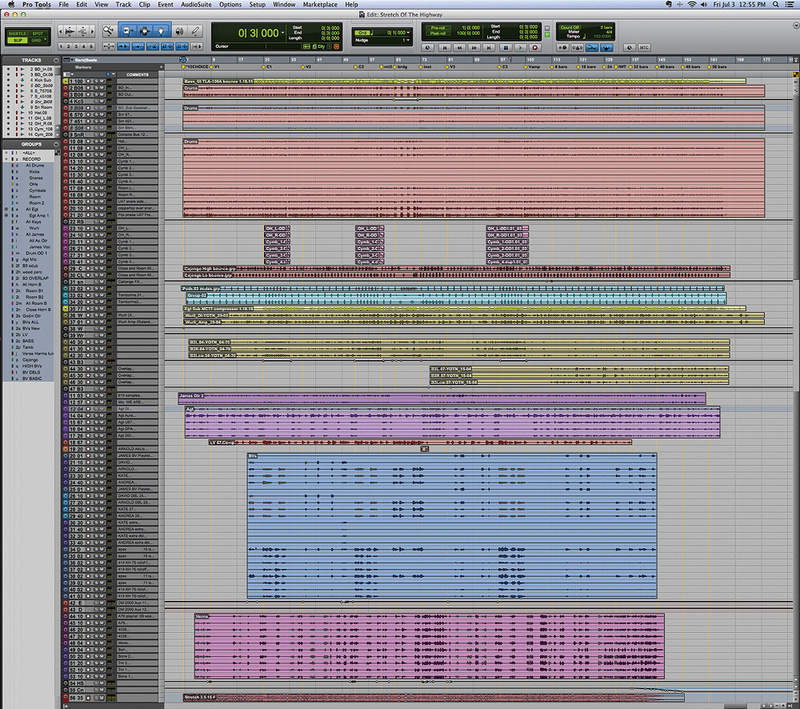 Every song was recorded as a complete take, other than one song in which we tacked on the final chord. In each case we ended up with that magical take. There still was a lot of work to do after tracking, but we knew we were building on a great foundation. 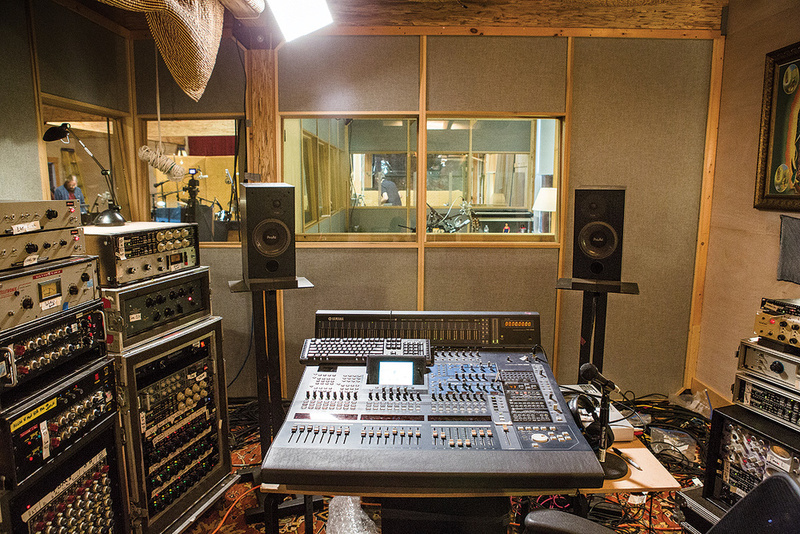 “My mic setup and signal chains were pretty similar for both the 2010 and 2014 sessions. On Steve’s drums I had a Sennheiser MD421 and an Electro–Voice RE20 on the kick, the snare had a Shure SM57 on top and bottom and also an AKG C451. Steve played brushes for the album, and the 451 is a little brighter, which was right for certain songs. The hi–hat also had a C451, the toms had Sennheiser MD421s, while the overhead mics were Apex — inexpensive Chinese–made tube mics that have been modified by Roy Hendrickson at Avatar. They sound great, a bit like Neumann U67s. I also had a Telefunken C29 Copperhead as a mono overhead, which sounded wonderful, plus several ambient mics, including a pair of Neumann U87s and a pair of U47s, and sometimes a third pair. We did not use all these mics on every song, I just had them there so I could use what was appropriate for each song. The mic pres on the drums were Neve 1081s, with the only outboard being a Pultec EQP1A on the snare, and [Empirical Labs] Distressors on the kick to grab any sudden peaks, because Steve is very dynamic. 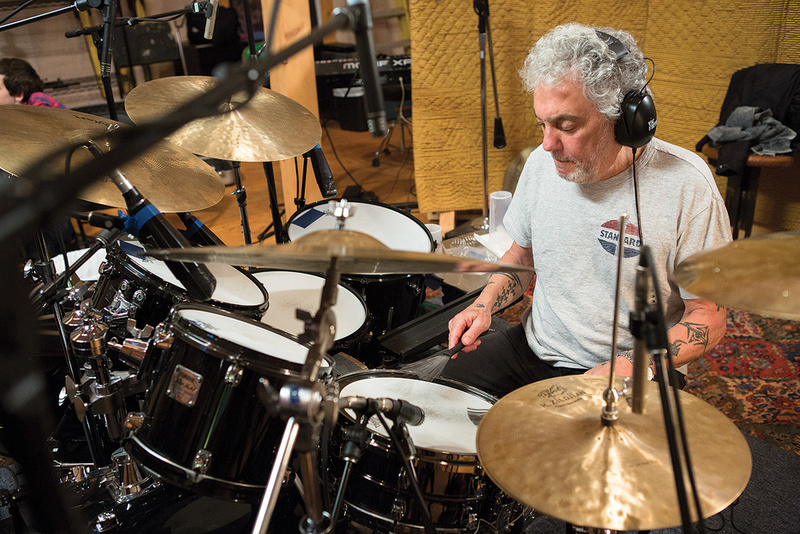 Steve Gadd is one of the world’s leading session drummers and a long–time member of James Taylor’s backing band. “The bass went direct via Jimmy’s DI box, and going via a Neve 33609 [compressor], not doing a lot, again just grabbing the peaks. The electric guitar amps had a Shure SM57 going into a Neve 1081 and a Beyer M160 going into a Mercury M76. 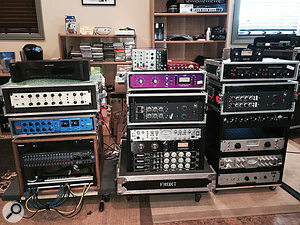 Mike gets his tone exactly right, and you just have to put some mics in front of his cabinet and, for the rest, stay out of the way. His cabinet was to the left of Steve Gadd, about 15 feet away, and we had some blankets around it, so we could give it its own space, but there definitely was some spill. Mike also played a nylon acoustic guitar, which was recorded via its pickup, going through a Millennia mic pre and then a Neve 33609. “We had several different keyboards, spread out over the room. I wanted to use real keyboards, so there are only a few synth pads on one or two songs, tucked in low. The main keyboards Larry used were two Wurlitzers, a Fender Rhodes, a B3 organ and a Yamaha C7 grand. I recorded the latter with Schoeps CMC6 mics, with CMC–6 Ug cardioid capsules, going into a pair of Avalon VT–737SP mic pres. We also had a [Neumann] U67 on the low end of the piano, into a Millennia mic pre, which was sometimes mixed in at a low level. The Rhodes and Wurlitzer were recorded direct, though we did also mic the speakers, but I didn’t use those tracks. The Wurlitzer went through a Roland JC120 which was placed in another room, with an SM57 on it. The amp sound added a bit of bite. Once the backing tracks were complete, a significant amount of work remained to be done. Taylor still had to finish the lyrics for a couple of songs, and overdubs of strings, horns, backing vocals and percussion were planned. The next step was a visit to Avatar Studios in New York, where they recorded strings for the song ‘Snowtime’ and horns for ‘Stretch Of The Highway’ and ‘You And I Again’, arranged by Rob Mounsey, plus Sting’s harmony vocal on the title track. After each group of sessions, O’Donnell would bring his gear and the recorded material to his Studio D, where he would tinker with the results, cleaning them up, editing them, and doing what he calls “pre–mixing”. He elaborates: “I use my studio mainly to edit and mix. There are some acoustic screens hanging from the ceiling and scattered around, to absorb certain frequencies and cut down on reflections. 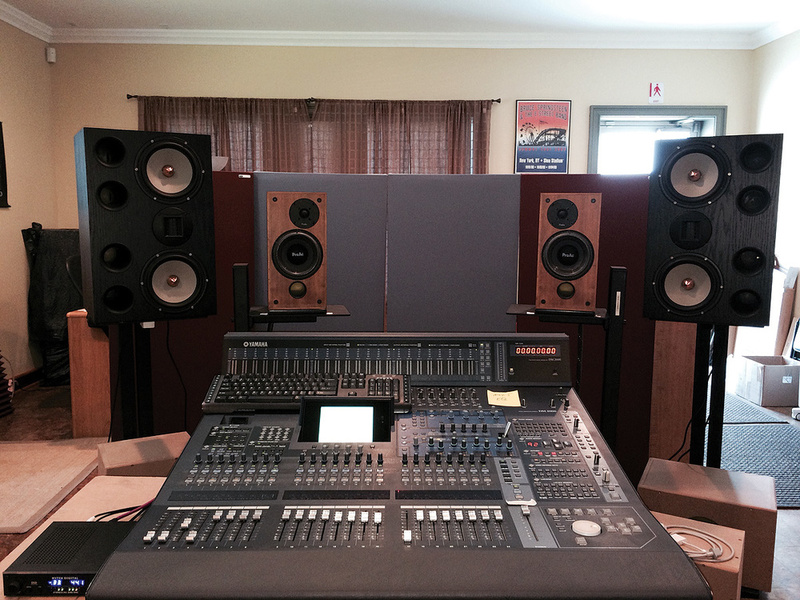 In addition to my ProAcs I also have Griffin G2B monitors, which I love. They are very flat, have a ribbon tweeter and sound very musical to me. 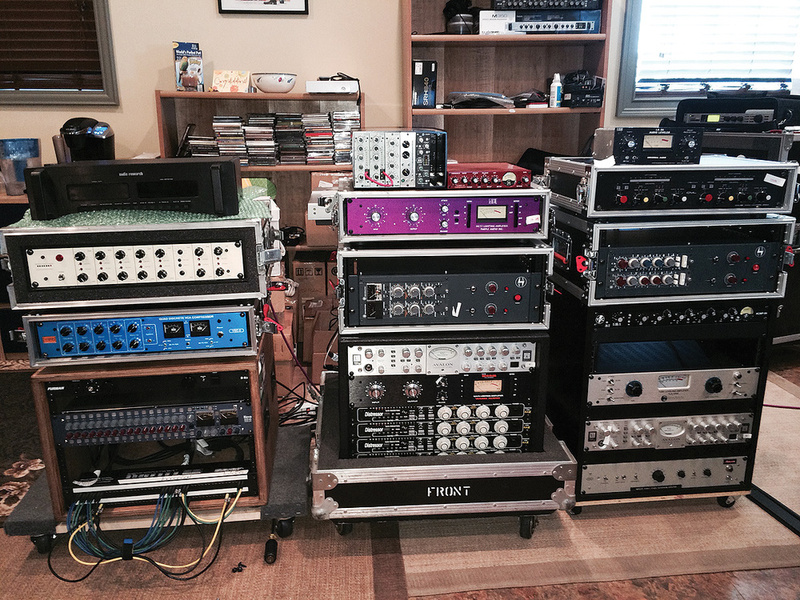 Dave O’Donnell’s gear usually resides here, at his own Studio D, but is racked ready to be taken elsewhere! “Originally the idea was to do the final mix at Avatar, or somewhere else with a nice Neve console, so I only did very basic things at my studio, occasionally dialling in a plug–in or a hardware insert where things were obviously needed, but I always had in mind that I’d end up taking the sessions to a big room. I’d work on the material while James was on tour, and when he had a break he wanted to work on the album. So I’d bring all my equipment up to the Barn, and we’d work there on comping and pre–mixing, and also did some additional overdubs. Yes, we transported my gear each time. We got that down to a science! Rick Kwan, who helped with engineering, and Sean Fay, the production assistant, would come and meet me each time with a truck, and help move the stuff. 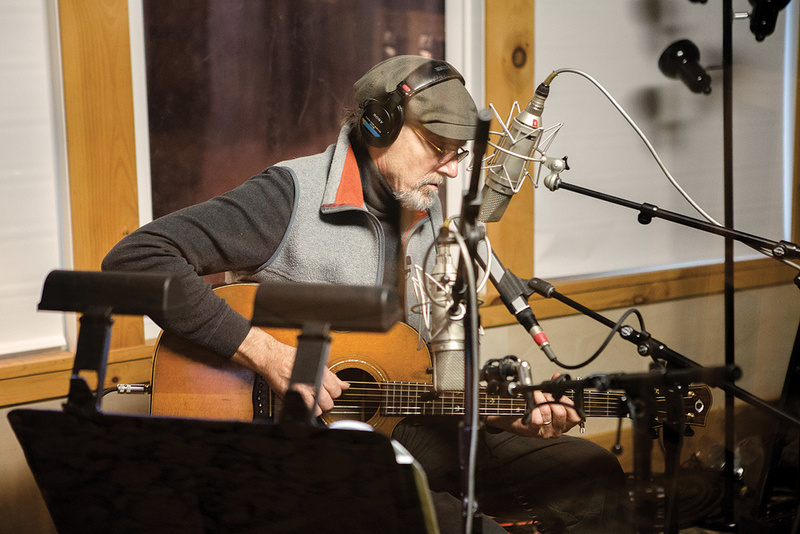 ‘Stretch Of The Highway’ is a mid–tempo song with a feel, groove and horn section a little reminiscent of Steely Dan, but still inimitably James Taylor because of the dominating presence of his vocals and acoustic guitar. The song’s 92–track session is very well organised and transparent, with, from top to bottom, one DI bass track, 24 drum audio tracks, five percussion audio tracks, one electric guitar track, two Wurlitzer audio tracks, six B3 organ audio tracks, seven acoustic guitar audio tracks, a lead vocal track, 22 backing vocal tracks, and 10 horn tracks, plus assorted aux, submix and final mix tracks. 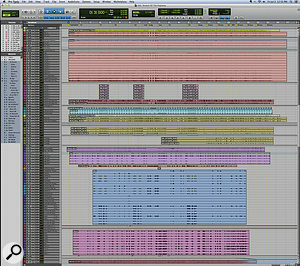 This composite screen capture shows the entire Pro Tools Edit window for ‘Stretch Of The Highway’. O’Donnell: “When I mix, I tend to have everything in [ie. not muted] most of the time. I get a good rough, and at that point I may go through each item as needed. It’s not necessarily in order, I just go for what strikes me. It often is the drums and bass, because they involve working on the low end, but it could also be the guitar, or the vocals, or something else. In the case of James’s records, his vocals and acoustic guitar are very much the focus. I might first spend some time working purely on either his vocals, or the acoustic guitar sound, fine–tuning the different mics on each. The acoustic guitar and the drums are also an essential part of the dynamics of the record, and it was with them in particular that I noticed that if I compressed too much, I was losing the emotion. When James and Steve dig in it is for a reason! “‘Stretch Of The Highway’ was the first song that we tracked, and it always felt great. It was not a difficult song to mix. The roughs were always good, so the final mix was simply a question of finishing where we left off. Having said that, I did still go through each track, just to double–check things, and I did dial in several pieces of outboard, as well as quite a few plug–ins. I used the Summit TLA–100A compressor on the bass, and on the kick drum the Heritage Audio 2264E Neve duplicate, which sounds excellent. Their 8173 modules are also great. “The main percussion track was cajongos [a cross between a cahon and a set of bongos! ], with the Waves Vintage Aphex Aural Exciter. I prefer the real Aural Exciter, but using it in the digital domain you get some latency, so it’s slightly out of phase, but in a bad way. There were a couple of songs in which I figured out a way to patch the hardware Exciter in and use it, for example as a direct insert on a guitar track, but if I wanted it on several different instruments, I ended up using the plug–in. I also sent the cajongos through the Tonelux 500–series TX5C compressor. A lot of the 500 series doesn’t sound great to me, but I love those compressors, and in this case I used them to enhance the ambience on the cajongos. The tambourines had just the [Waves] Renaissance Compressor, to grab peaks and even things out. “Beneath the B3 tracks are James’s tracks. The first one is his Godin MIDI guitar, which he overdubbed. We had a microphone on it, and also recorded it direct, and had to slide one track 619 samples to time–align them. The main acoustic guitar was recorded with the Fishman Aura box, a U67, DPA 4099 and the 260. I used the Massenburg EQ plug–in to roll off some low end at 80Hz, and on two of the guitar tracks I had the Waves Renaissance compressor and the Aphex Aural Exciter. Unusually, the Aura was used considerably in this song, because James had been singing the whole time during tracking. He later overdubbed most of his vocal part, but the acoustic guitar part had such a great feel that rather than redo it, we’d bring up the acoustic guitar mics when he isn’t singing, and used the Aura track when he is singing, to make sure you don’t hear any original vocal bleed. “James’s lead vocal has a Massenburg EQ plug–in, and then goes to an outboard Massenburg compressor, and into the Q–Clone for some EQ. I also used the TC Electronic 4000 reverb on his vocal. The backing vocals for this track were recorded both at United Recording in LA and the hotel room in San Francisco. They had come up with a different chorus part while on tour which they liked better, so we re–recorded some of the parts in San Francisco. They had the Massenburg plug–in EQ, a Waves Puigchild 660 [compressor], and some Aphex Aural Exciter, plus the UAD EMT 250 and Roland Dimension D [chorus] plug–ins. Underneath the backing vocals are the horns, which had the Q–Clone with the Heritage EQ and some EQ and compression from the DM2000. 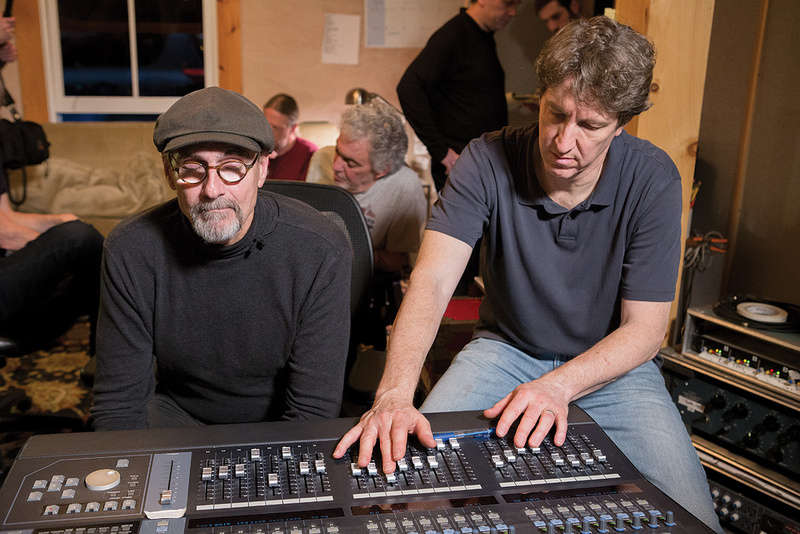 “In general I’m still more a fan of hardware than of plug–ins,” says Dave O’Donnell, “although during the last couple of years plug–ins have become significantly better, and there are some newer companies making things that are more interesting than just analogue gear emulations. This week I’ve been trying out some FabFilter and DMG plug–ins, which to me is the way to go, to some degree using traditional analogue principles but not necessarily trying to emulate specific gear. Though the danger with some of these plug–ins is that you end up mixing with your eyes, rather than your ears! When I mix I have my screen off to the side, so I can listen without seeing things, because no matter how experienced you are, looking at what happens on the screen changes the way you hear it.